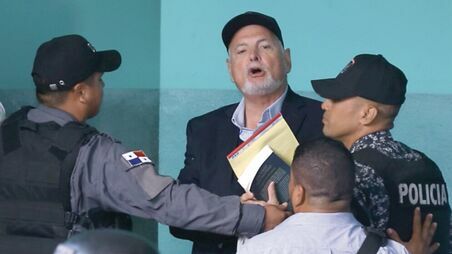 Jailed ex-president Ricardo Martinelli whose criminal trial for mass illegal snooping resumes on Friday, March 22 has filed a complaint about an alleged crime against honor, in the form of slander and insult, in an opinion column in La Estrella de Panamá. "We are facing a quarrel so absurd that if it were not a former president of the Republic and a country where institutionality is so deteriorated, I would simply laugh," said Quirós. It is the second complaint of the former president against GESE, for an opinion article. Last February he took action against the newspaper for the publication of the article " Las paletas del loco,” (The flailing of the crazy one) signed by Mariano Mena. It is common for Martinelli and his family to file lawsuits against journalists and media. On August 21, five journalists from La Prensa testified before the Public Prosecutor's Office following a lawsuit that sought to "order the media, the written press, television, radio and social networks, and especially the newspaper La Prensa to cease, cease and refrain from disclosing or publishing facts and situations of a private and family nature, and the first and last name or surnames in general of the family group, as part of a media campaign against the members of this Panamanian family ". The former president also took legal action against Mariela Ledezma and Annette Planells, from the Sal y Pimienta (Salt and Pepper) radio program. Journalist unions have warned that these demands seek to silence any criticism against the ex-president and his family, under investigation in multiple corruption cases.